As seen in the PMP Training, Work breakdown structure of a project shows the hierarchy of the project work and deliverables in a project. Therefore, there are lots of benefits of using WBS Project Management. Its creation process is the 4th process of Scope Management, coming after Create Scope Management Plan Process, Collect Requirements Process and Define Scope Process. 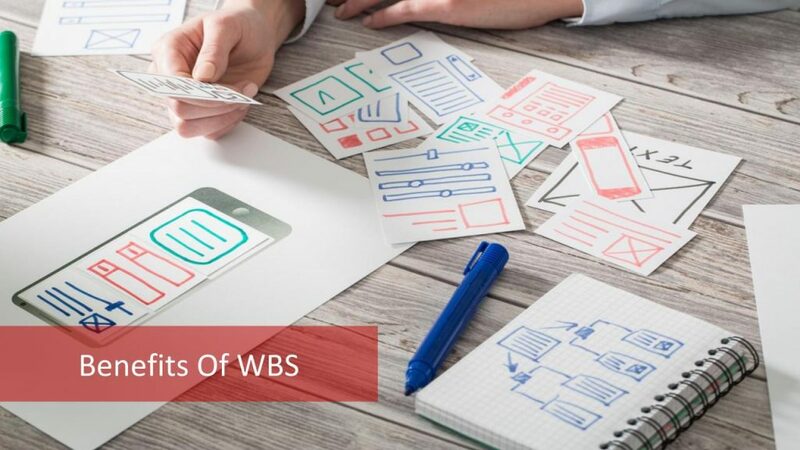 In this article we are going to deeply analyze the benefits of using the WBS Project Management, the activities coming after its creation and what are the best practices for using the WBS. Let’s start with the benefits of WBS! 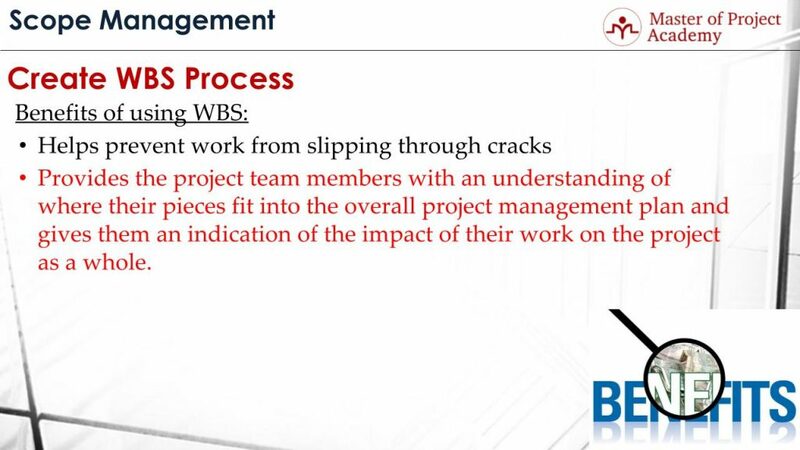 The first benefit of using WBS Project Management is that it helps prevent work from slipping through cracks. Since WBS Project Management shows the project deliverables and work that needs to be completed in a project, it actually guides the project team on what needs to be done in an organized manner. 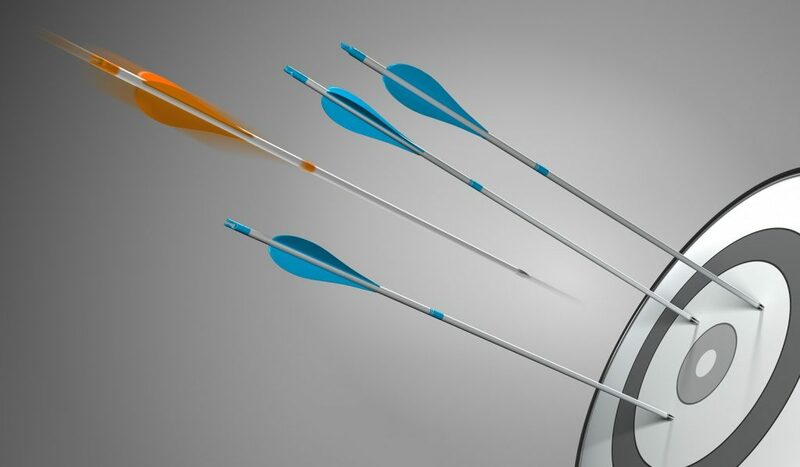 By this way, unnecessary work or anything not directly in the project scope is eliminated. And this way, it helps the team to focus on the project scope only. Another benefit of using WBS Project Management is that it provides the project team members an understanding of where their pieces fit into the overall project management plan and it gives them an indication of the impact of their work on the project as a whole. Let’s consider an Aircraft system’s WBS Project Management sample. A project team member working on engine work package will be able to see how his activities will help to complete the overall project and product scope. If you consider that there will be several project team members, WBS will help the project team to see how each activity or deliverable helps in completing the product and project scope. WBS Project Management facilitates communication and cooperation between and among the project team and other stakeholders. WBS Project Management shows the hierarchy of the project work and deliverables of a project scope, completed work, remaining work and project team members working on same work package etc. So all of these can be easily communicated to project stakeholders with the help of WBS Project Management. Since there will be several smaller parts under work packages, and these will be assigned to project team members, WBS Project Management will be helpful for the cooperation between project team members for completing project activities respectively. Using WBS Project Management helps prevent changes. Changes are inevitable in a project. But, preventive and corrective actions must be taken to prevent root cause of changes in a project. Changes might happen because of an unclear project scope or missing requirements in a project as well. WBS Project Management shows the breakdown of the project scope, work that needs to be performed and also deliverables as granular as much in a project. Therefore, WBS Project Management helps prevent changes since it helps to clear project scope for all project stakeholders. WBS Project Management provides a basis for estimating staff, cost and time. This is a very important benefit of using WBS Project Management. It is always hard to make estimations about staff requirements, cost and time for a big amount of work. There will be a higher possibility of deviations in actual results if estimations are done over bigger work packages. But if all work is divided into smaller parts, it will be easier to do an estimation. The deviation amount and possibility will be reduced respectively. Is it easy to make an estimation about a whole aircraft system? Or breaking down the project work into smaller pieces and making an estimation for each smaller part such as engine development, entertainment system integration? Of course, smaller pieces will be estimated easily and more accurately by the project team. WBS Project Management is the foundation of the project. Almost everything that occurs in planning process after the creation of WBS, is directly related to WBS Project Management. This is a crucial benefit of WBS. Since WBS Project Management shows the snapshot of project work and deliverables to complete the project scope, it is actually the foundations of planning. Cost estimation, time estimation, resource estimations, schedule planning etc. are all done with the help of WBS Project Management. Therefore, WBS plays a vital role in project planning. Project costs are estimated at work package level. Since WBS Project Management shows smaller pieces of project work and deliverables, project cost estimation can be done at work package level. Then, the cost of each work package level is summed up towards the 1st level of WBS Project Management to estimate the overall project budget. Risks are identified by work package. Therefore, during risk planning, risks that are associated with each item in the WBS Project Management are outlined and all project risks are identified with the help of WBS. Work packages are assigned to individuals or parts of the organization. Since WBS Project Management breaks down each work or deliverable into smaller pieces, it makes management, execution, coordination and monitoring easier. Generally, each work package is small enough to assign to a project team member, or part of the organization, for instance, assignment to training department, test team etc. What happens after the creation of WBS Project Management? 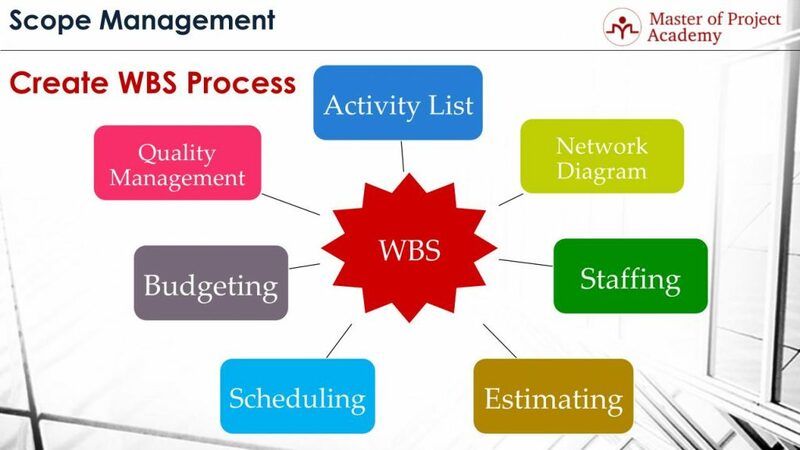 This figure above shows, which activities can be completed after the creation of WBS Project Management. As you see, WBS is at the heart of the many critical activities in a project. Activity list of a project shows which activities to perform throughout the project to complete the project scope. 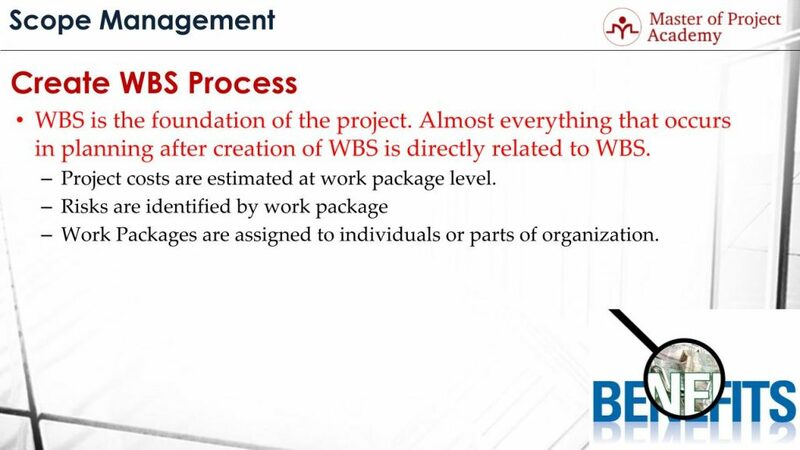 Since WBS Project Management shows the work and deliverable hierarchy of a project, activities that need to be performed can be derived from the work packages under the WBS. Network diagram of a project shows the interrelationships of project activities. It shows finish to finish, finish to start, start to start and start to finish relationships of activities. For instance, if you are working on an e-commerce shopping website project, you cannot start the testing of activities before the development of the activities finishes. Or in a construction project, you cannot start to construct the building before procurement of materials. Network diagram shows interrelationships of all project activities and helps in determining the project schedule respectively. Since WBS Project Management shows the hierarchy of project work and deliverables, it will directly help in determining the project activity relationship and creation of the network diagram respectively. Staffing is actually determining the human resource necessity of the project. Since WBS Project Management will show the project work and deliverables, it will help to determine the project staff who can complete the project activities. These include the competence requirements, the number of staff, skill set etc. Estimating is done with the help of WBS Project Management as we stated previously. Since WBS shows a detailed outline and smaller pieces of work and deliverables that need to be completed, it is used as a primary input in cost, time, resource and other estimations as well. Scheduling is also completed with the help of WBS Project Management. Scheduling is actually finalizing start and finish dates of each activity and completing the start and finish dates of overall project respectively. After creation of network diagram and using the time estimations for each activity, scheduling of the project will be completed. Budgeting can be completed after finishing cost estimations of WBS Project Management items. Because project budget shows the total amount of money that is required to complete a project. After estimating cost requirement of each work package in the WBS, these estimates are sum up to find the total project budget. Quality management activities can be planned based on the WBS Project Management as well. How to Use WBS Project Management? 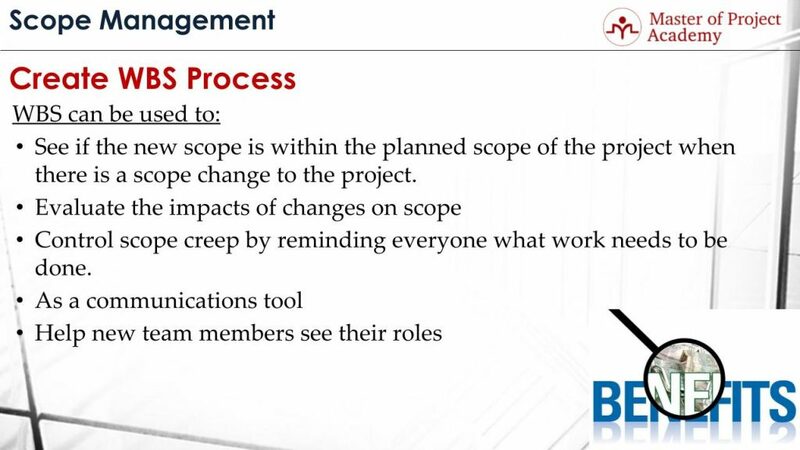 When a scope change happens, WBS can be helpful to see if the new scope is within the planned scope of the project. There will be changes in a project. Since WBS Project Management shows the overall project scope and deliverables of the project, how to fit the change into the existing project scope can be identified with the help of WBS Project Management. 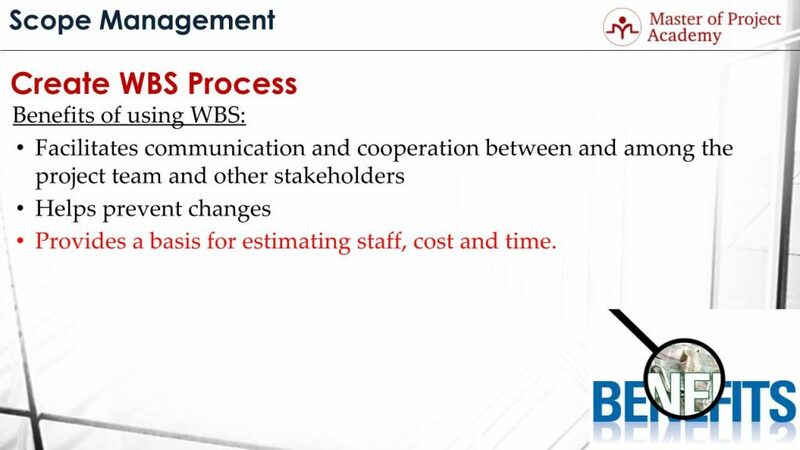 WBS Project Management can be used to evaluate the impacts of changes on the scope. A small change on a minor part of the project might affect several other aspects of the project. Since WBS Project Management shows the hierarchy of the project work and deliverables, a scope change on a work package might affect other parts related to that work package as well. This can be easily seen with the help of the WBS Project Management. WBS can be used to control scope creep by reminding everyone what work needs to be done. WBS Project Management shows the overall project work and deliverables. Therefore, anything that is not seen in WBS will be out of project scope. If stakeholders are reminded to visit Work Breakdown Structure frequently, this will help to keep them on the same table and prevent scope creep respectively. WBS Project Management can be used as a communications tool as well. Since it shows the relationship and hierarchy of project work and deliverables, communication and cooperation of project stakeholders can be done with the help of the Work Breakdown Structure. Finally, WBS can help new team members to see their roles. When a new team member joins the team, overall project scope, project objectives and goals must be introduced to the new team member. WBS will be a good starting point to show all project work and project deliverables. By this way, once they are assigned to new activities, they will be able to see how his activities fit into the overall project scope with the help of the Work Breakdown Structure.